FREE delivery to United Kingdom in 4 - 6 weeks. 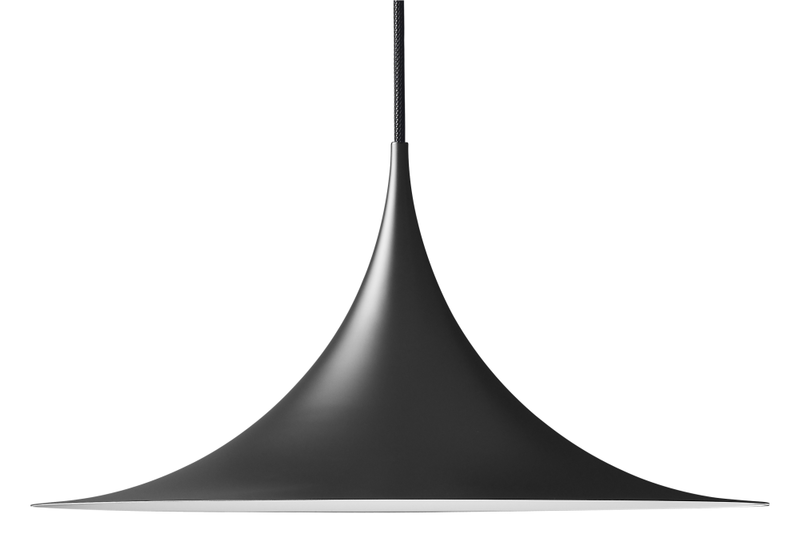 The Semi Pendant is a unique pendant lamp, based on two quarter-circles put together, back-to-back. It's distinctive arch-shaped, enamelled metal shade creates a diffused, cone-shaped light, ideal over a dining table or kitchen work surface. With its lightness of form, unique timeless design and range of colours and sizes, the Semi Pendant is extremely versatile and well suited to both private and public spaces. Torsten Thorup (born 1944) and Claus Bonderup (born 1943) both graduated from The Royal Danish Academy of Fine Arts' School of Architecture in 1969 and subsequently went to work together at Danish architect, Henning Larsen's studio. The two architects teamed up professionally and worked together for the majority of their careers. Together they've designed watches and in-store displays for Georg Jensen, the Arktikum museum in Finland and the harbour area in Elsinore, where they designed everything, from urban planning to the ticket offices.